If you had a talented 12-year-old son who had aspirations to play quarterback in the National Football League would you send him to Tommy Wyatt’s Championship Quarterback School or would you rather select John Elway’s Championship Quarterback School? That was not a rhetorical question. There is a right and wrong answer. First, let me clarify that both guys were championship quarterbacks. Tommy Wyatt, for the 1989 Newtown Men’s League Champions. 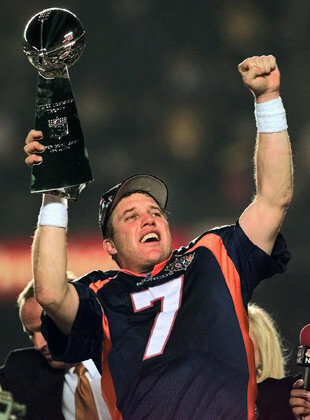 John Elway, for the 1997 and 98 Denver Broncos Super Bowl Champions. Both know a lot more than your 12-year-old about the quarterback position. Both are excellent teachers and communicators. And both would do a good job. But only one of the two aforementioned ex-quarterbacks is qualified to teach your son what it takes to play in the NFL. Only one. Hint . . . it’s not me! As ridiculous as that whole scenario may sound, we’re seeing people (more than ever before) passing themselves off as “experts” in everything. Some are qualified. Most are not. I always thought it odd while watching those late-night informercials years ago how these guys would come on and talk to you for 60 minutes trying to sell you their “Secrets to Success” packages for three easy payments of $199. My first though was always, “if they’re so rich and successful, then why would they take the time to get on this commercial and try to sell people the secrets?” Legitimate question. Today, in this age of technology, EVERYBODY’S an expert on everything. Online you can be young even though you’re old. You can be skinny even though you’re really fat. You can be a woman when you’re a man. You can have a degree from Harvard even though you never made it out of high school. I mean, if it’s online it’s obviously true. Right? Much of this “poser” behavior is harmless, but let’s chat about the posers that are trying to get into your wallet. I’m talking about the “Success Coach” who has never been successful; The “Life Coach” with a lousy life; The “Abundance Coach” without a pot to piss in; The 350-pound “Health and Wellness Coach”; The “Network Marketing Guru” who never made money in network marketing; The “Internet Marketing Expert” who not only never made any money, but isn’t even going by his real name! And don’t get me started on people writing “How To” books on things that they never did! “How to Become a Brain Surgeon in One Simple Step” – go to med school. There. That was easy. They are people who want to make their money by taking your money?I recently saw an online list of Top Worldwide Money Earners in network marketing.” There were at least ten names on that list of people who don’t even earn $100k a year and one (ranked really high up there) who could make more money working 20 hours a week at McDonald’s. Seriously.Some wise person once said, “Believe none of what you hear and only half of what you see.” And that was before the internet! My plea to the “entrepreneurs” who want to earn a living selling their advice as “experts” in anything . . . first go out there an DO IT yourself. Go out there and earn the right to be heard. Because if you’re trying to pass yourself off as something you’re not, that’s being a scammer. That’s taking advantage of somebody’s trusting and naive nature. It’s false advertising. Like Tommy Wyatt the quarterback, you might be able to be helpful to the beginner. And if that’s your only goal – then state your credentials and make reasonable promises offering reasonable expectations. On the other side of the coin, if you’re somebody who is looking for a coach or an “expert,” do your homework first. Don’t just read the testimonials on the person’s webpage. They probably wrote most of them themselves! Call me crazy, but I want my financial advisor to have a track record. I want my doctor to actually be a doctor. I’d rather eat a meal prepared by a chef than the eccentric (and cold) concoctions my children whip up while playing chef.OK, rant over. I have to go show some young scientists how to split the atom. Tommy, as usual, I always learn something from the articles (books, blogs, etc.) you write. This one is really good. Great Thanks Tommy your 100% on the ball.